Under a proposal championed by Governor Andrew Cuomo, New York would become the first state in the nation to mandate a minimum wage of $15 an hour. That’s more than double the federal minimum wage, and 67 percent higher than the $9 statewide minimum already scheduled to take effect in New York at the end of 2015. Advocates of such a policy believe that low-income workers will be its primary beneficiaries. This paper, however, suggests that the poorest New Yorkers would have the most to lose from a sharp rise in the government-mandated wage floor. The authors, economists Douglas Holtz-Eakin and Ben Gitis of the American Action Forum, draw on three credible research models to estimate low, medium and high impacts from raising the statewide minimum wage to $12 or $15. The key finding: a $15 minimum wage ultimately would cost the state at least 200,000 jobs, with proportionately larger employment decreases in upstate regions. That’s the authors’ “low-impact” scenario, based on a model developed by the Congressional Budget Office, of which Holtz-Eakin is a former director. The other two models point to even bigger losses, indicating that a $15 an hour minimum wage would lead to 432,200 and 588,000 fewer jobs under the “medium impact” and “high impact” scenarios, respectively. Job losses would be smaller, but still more than New Yorkers should be willing to tolerate, if the state was to set the minimum at $12 an hour, according to Holtz-Eakin and Gitis. Based on national labor force data, the authors of this paper estimate less than 7 percent of the wages generated by a $15 wage, and less than 6 percent of the wages generated by a $12 wage, would actually go to households in poverty. As Holtz-Eakin and Gitis note, these findings are consistent with the preponderance of economic research, which has long indicated that higher minimum wages are associated with a decline in employment. To be sure, economists differ on the strength of the effect, which is why this paper draws from different approaches—with the CBO model at the lower bound—to illustrate a range of possible impacts. The “Fight for $15” is rooted in well-founded and understandable concern about the challenges faced by low-income households, especially those struggling to get by in hyper-expensive New York City. But a $15 minimum wage is only likely to make those challenges worse. As shown in this paper and as strongly suggested by other research on the general issue, enacting the biggest increase ever in New York’s minimum wage would benefit some low-income workers at the expense of others.The losers would be stuck with the ultimate minimum wage: zero. In a prolonged period of slow economic growth, the potential loss of at least 200,000 jobs would be an extreme and unacceptable tradeoff. We applied the methodology of three different independent research models to examine the employment and earnings effects of raising New York’s statewide minimum wage to $12 per hour and to $15 per hour, respectively, by 2018 in New York City and 2021 in the rest of the state. We focus on how raising the state minimum wage would affect the very workers whom the policy is intended to help. Overall, we find significant tradeoffs to raising New York’s proposed minimum wage. While a minimum wage hike would benefit some workers by increasing their earnings, it would also hurt hundreds of thousands of others whose earnings would sink because they could no longer find or keep a job. Our medium-impact estimates (below) show that raising the state’s minimum wage to $12 per hour would affect 2.3 million low-wage workers while costing the state 216,200 jobs. On net, total wage earnings among low-wage workers would rise by $1.1 billion. Similarly, we find that increasing the state’s minimum wage to $15 per hour would affect 3.1 million workers and cost 432,500 jobs. Total wage earnings among low-wage workers would rise by $4.6 billion, after accounting for earnings declines from job losses. Taken at face value, the net total wage earnings gains for both the $12 and $15 per hour minimum wage may seem large. But, it is important to point out that only a very small amount of the total wage earnings gains would benefit workers in poverty. In previous American Action Forum (AAF) research, we found that only 5.8 percent of net total wage earnings gained from a $12 federal minimum wage and only 6.7 percent of the net total wage earnings gained from a $15 federal minimum wage would actually go to households in poverty. In New York, this means that of the $1.1 billion gained from the $12 minimum wage, only $61.9 million would go to workers in poverty. Likewise, only $308.0 million of the $4.6 billion gained from the $15 minimum wage would help workers in poverty. Because the exact effect of the minimum wage on employment remains unsettled, we check the robustness of our results by employing a range of estimates from literature that imply low, medium and high employment impacts. The federal minimum wage has been set at $7.25 an hour since July 2009. In recent years, some American policymakers and labor advocates have argued for further increases in the wage at the federal, state, and local levels. On the federal level, the Obama administration and top congressional Democrats have rallied behind a proposal to raise the federal minimum to $12 per hour by 2020. Under another proposal championed by, among others, Sen. Bernie Sanders, the federal minimum would rise to $15 per hour, a level now in the process of being implemented in Seattle and a handful of other localities. AAF, along with the Manhattan Institute, previously analyzed the employment and earnings effects of these two policies on a national level, and found that they would induce substantial job losses with little benefit for those in poverty. New York’s minimum wage currently stands at $8.75 and is scheduled to reach $9 an hour on December 31, 2015. However, based on recommendations of a Wage Board empaneled to study the issue at the request of Governor Andrew Cuomo, the state labor commissioner has issued an order raising the minimum wage to $15 an hour for employees of fast-food chain restaurants in New York. Soon after the Wage Board recommendation for fast-food workers, the governor announced he would propose legislation raising New York’s statewide minimum wage to $15 per hour for all workers. The governor’s proposal would parallel the fast-food schedule, raising the state’s minimum wage to $15 per hour by 2018 in New York City and by 2021 for the rest of the state. To test the impact of such policies, this paper estimates the employment and earnings effects of increasing New York’s minimum wage to two alternative higher levels— $12 and to $15 per hour—in each region of the state, focusing on the low-wage workers whom such raises would be intended to assist. In doing so, we project a range of job losses if lawmakers were to raise the state’s minimum wage to $12 or to $15 per hour and the net change in total wage earnings for all low-wage workers in the state. We utilize research by the CBO (2014), Meer & West (2015), and Clemens & Wither (2014) to provide a range of estimates for the impact of a $12 and a $15 minimum wage on New York state employment and total wage earnings. These studies examined different labor-market aspects of the minimum wage, resulting in different conclusions regarding the policy’s impact on employment and wage earnings. Using these three studies, we consider the effects of the minimum wage under three scenarios — low, medium and high employment impacts. In our previous paper, we used these same studies to examine the impact of raising the federal minimum wage on national employment and total wage earnings. Our medium-impact scenario was based on the model developed by Meer & West (2015). With that model, we found that raising the federal minimum wage to $12 per hour by 2020 would cost 3.8 million jobs and, on net, increase total wage earnings by $14.2 billion. Increasing the federal minimum wage to $15 per hour by 2020 would cost 6.6 million jobs and, on net, increase total wage earnings by $105.4 billion. In 2014, the Congressional Budget Office (CBO) examined the impact of raising the federal minimum wage to $9.00 or $10.10 per hour, two of the most popular proposals at that time. For the $10.10 proposal, the CBO found that the policy would result in employment falling by 500,000 jobs relative to their projected 2016 baseline. The CBO assumed that, in addition to those earning between $7.25 and $10.10 getting a raise, those earning just above $10.10 would also see their wages increase. Specifically, those who earn up to 50 percent more than the minimum-wage hike would see their hourly earnings rise. As a result, people earning below $11.50 (who stay employed) would benefit from a wage increase of some sort. The CBO concluded that net total wage earnings for low-wage workers would increase by $31 billion: 19 percent of those additional earnings would go to families below the poverty threshold; 52 percent to families with incomes one to three times the poverty threshold; and 29 percent to families with incomes more than three times the poverty threshold. We employ these findings when developing our projection of a low-impact employment scenario resulting from an increase in New York’s statewide minimum wage. While there is an ongoing debate regarding the impact of the minimum wage on the level of employment, Texas A&M economists Jonathan Meer and Jeremy West suggested in their recent research that the negative impact of the minimum wage is best isolated by focusing on employment dynamics—that is, the change in job growth once the higher wage is implemented. Specifically, they found that a 10 percent increase in the real minimum wage is associated with a 0.30 to 0.53 percentage-point decrease in the net job-growth rate. They found that, as a result, the 10 percent minimum wage increase reduces future employment by 0.7 percent. Previously, the AAF applied Meer & West’s work to California’s recent law that raises the state’s minimum wage to $10 per hour (effective 2016). Using Meer & West’s result, the AAF found that this wage increase in California would mean a loss of 191,000 jobs that would never be created. In addition, the AAF found that if every state followed suit, more than 2.3 million new jobs would be lost across the United States. We employ the estimates found in Meer & West’s study to characterize medium-impact employment consequences of raising the minimum wage in New York. In late 2014, Jeffrey Clemens and Michael Wither of the University of California at San Diego released research examining what happened to low-wage workers the last time that the federal government raised its minimum wage—rising in three steps, during 2007–09, from $5.15 to $7.25 per hour. Using data from the Survey of Income and Program Participation (SIPP), they focused on how the minimum-wage hike affected employment and earnings among those whom the minimum-wage hike affected most: low-wage workers earning below $7.50 per hour. Clemens and Wither found significant, negative consequences for low-wage workers. From 2006 to 2012, employment in this group fell by 8 percent, translating to about 1.7 million jobs. The job loss in this low-wage group accounted for 14 percent of the national decline in employment during this period. The minimum-wage hike also increased the probability of working without pay (e.g., unpaid internships) by 2 percentage points. Workers with at least some college education were 20 percent more likely to work without pay than before the minimum wage rose. As a result of the reduction in employment and paid work, net average monthly earnings for low-wage workers fell by $100 during the first year after the minimum wage increased and fell by an additional $50 in the following two years. We use the Clemens & Wither estimates to estimate our high-impact employment scenario. In identifying the number of workers whom the minimum wage hike would affect in New York, we assume that those most directly affected by the minimum wage increase are the workers who, we project, would earn between $9 per hour (New York’s statewide minimum wage effective December 31, 2015) and the new minimum wage level in 2021 (2018 for the New York City region) under current law. For the $12 minimum wage, this includes all workers who would earn between $9 and $12 per hour; for the $15 minimum wage, it includes everyone who would earn between $9 and $15 per hour. This is the group of workers that we assume would both suffer from all the job losses and benefit from any wage earnings gain. To estimate the actual number of workers who would be impacted by the minimum wage and thus either lose their jobs or see their wages rise, we first project total regional employment levels by 2021 (2018 for New York City). We accomplish this by using the state Labor Department’s Employment Projections to calculate the projected compounded annual growth rate for total employment in each region. Starting with 2014 total employment reported in each region by the New York Quarterly Census of Employment and Wages, we project employment levels to 2021 (2018 for New York City). After projecting total future employment levels in each region, we estimate how many of those workers would earn between $9 and $12 per hour and between $9 and $15 per hour under current law. With regional American Community Survey (ACS) data, we obtain the percent of workers who would earn at least $9 per hour but less than $12 and $15 per hour by 2018 in New York City and 2021 in all other regions. [11,12] We multiply that percentage by the projected total employment levels in each region to estimate the number of workers who would earn between $9 per hour and the new minimum wage levels in 2021 (2018 for New York City) under current law. Table 1 on page 5 shows the projected number of workers statewide and in each region who would be impacted if lawmakers raised New York’s minimum wage to $12 or to $15 per hour. We estimate that raising New York’s minimum wage to $12 per hour would impact about 2.3 million workers statewide, about 24.4 percent of the employed population. Raising it to $15 per hour would impact about 3.1 million workers or 33.2 percent of the workforce. The percent of the population affected in each region depends entirely on the frequency of low-wage employment. Long Island, for instance, appears to have the fewest low-wage workers as a $12 minimum wage would impact 18.1 percent of workers and a $15 minimum wage would impact 25.1 percent. In the North Country, however, those minimum wage hikes would affect 30.5 percent and 41.6 percent of workers, respectively. However, the potential employment consequences of mandating a minimum wage hike call the merits of this policy into question. When a state government increases the minimum hourly pay for private-sector workers, it effectively increases the per-hour cost of low-wage labor. Employers have three main ways to pay for the additional labor cost: lower profits, higher prices, and fewer workers. While many labor advocates assume that employers will absorb a state-mandated increase in labor costs through a reduction in profits, the evidence suggests that the vast majority of low-wage workers are in industries with thin profit margins, such as retailers and restaurants. In these industries, businesses tend to pay for minimum wage hikes by increasing prices, reducing current and future employment, or both. While the exact impact of a minimum wage hike on employment is debated, extensive economic literature, from the 1950s to today, concludes that raising the minimum wage has a negative impact on employment levels and job creation. Moreover, the literature shows that the workers who tend to become jobless are the low-skilled, low-wage workers whom the policy intends to help. The CBO, Meer & West, and Clemens & Wither research on the issue demonstrate negative labor market consequences with varying degrees of severity. In this section, we apply their findings to proposals to raise New York’s statewide minimum wage. In particular, for each region we will estimate the labor market consequences of raising the state’s minimum wage to $12 and to $15 by 2021 (2018 for New York City). We follow our previous study’s methodology by assuming that all job losses occur within the group of workers who would earn between $9 and the new minimum-wage level under current law. As a result, we assume no job losses among workers earning more than the new minimum-wage level. To preview our estimates, we find that increasing New York’s minimum wage to $12 per hour would reduce employment by 76,600 to 290,400 jobs. Raising the minimum wage to $15 per hour would cost the state 200,000 to 588,800 jobs. Overall, we estimate that if the minimum wage rose to $12 per hour, low-wage employment in New York would be 76,600 to 290,400 lower than under current law. Using the CBO report, our low-impact employment scenario, we find that raising the minimum wage to $12 per hour by 2018 for New York City and 2021 for the rest of the state would cost 76,600 jobs statewide. This means that total employment would decline by 0.8 percent. The job losses would range from about 1,600 in North Country to 37,400 in New York City. Although the rural areas of New York would lose fewer workers than the urban areas, the job losses would be proportionally more significant. In the Hudson Valley and on Long Island, for instance, employment would only decline by 0.7 percent and 0.6 percent, respectively. But in the North Country and Southern Tier, employment would decline by 1 percent. In our medium-impact employment scenario, derived from Meer & West, we find that this minimum wage increase would reduce employment significantly, costing 216,200 low-wage jobs. Meer & West’s research models the impact of the minimum wage on total employment levels, not just low-wage workers. So while the other models are sensitive to the prevalence of low-wage work in each region, our medium-impact employment model is not. As a result, the estimated percent reduction in employment is the same across the state. Finally, with the Clemens & Wither model, our high-impact employment scenario, we estimate that raising the minimum wage to $12 per hour would cost 290,400 jobs. This model does depend on the prevalence of low-wage employment, which allows us to examine how raising the minimum wage in New York would affect each region differently. We find that the decline in employment in this scenario ranges from 2.6 percent on Long Island to 3.4 percent in the North Country. We estimate that 200,000 to 588,800 fewer low-wage jobs would exist in 2021 (2018 in New York City) if New York policymakers increased the state minimum wage to $15 per hour. Using the CBO estimate, we find that increasing the state’s minimum wage to $15 per hour would cost 200,000 jobs. Among the state’s regions, the reduction in employment would range from 1.6 percent on Long Island to 2.7 percent in the North Country. The reduction in job creation captured by the Meer & West estimate reveals that New York would have 432,500 fewer jobs than under current law, reducing projected employment by 4.7 percent. Using the Clemens & Wither estimate points to a loss of 588,800 jobs, a 6.4 percent decline in employment. Under this scenario, we find that the job losses would range from 5.2 percent on Long Island to 7.3 percent in the North Country. In this section, we project how increasing New York’s statewide minimum wage to $12 and to $15 per hour by 2021 (2018 in New York City) would affect total wage earnings of low-wage workers. This involves calculating the total wage earnings increase for those employed and the total wage earnings loss for those who can no longer find jobs. After subtracting total wage earnings lost from total wage earnings gained, we derive the net change in total wage earnings for all low-wage workers. For all workers who would keep their jobs and would earn between $9 and the new minimum wage level under current law, we assume that increasing the minimum wage would raise their hourly pay rate to the new minimum wage level. In the $12 minimum wage scenario, for all workers who earn between $9 and $12 per hour in 2021 (2018 in New York City), we assume that wages would rise to $12 per hour—if they stay employed. Likewise, in the $15 minimum wage scenario, we assume that all works earning between $9 and $15 per hour would see their wages rise to $15 per hour—if they stay employed. Under both the $12 and $15 minimum wage scenarios, we assume that the minimum wage increase itself would have no impact on hours worked per week and weeks worked per year—for those who keep their jobs. In addition, we assume that all who would be jobless as a result of the minimum wage increase would see their annual wage earnings fall to $0. To estimate the change in total wage earnings, we utilize ACS data to project average hourly pay, annual pay, and hours per year in each region for workers who would earn between $9 and $12 per hour and between $9 and $15 per hour under current law. With that information, we estimate the total wage earnings lost among the low-wage workers who lose their jobs and the total wage earnings gained among those who remain employed. Overall, we calculate the net change in total wage earnings for low-wage workers by subtracting total wage earnings lost from total wage earnings gained. As shown in Table 4, the impact of raising New York’s minimum wage to $12 per hour on the total wage earnings of low-wage workers depends largely on how many become jobless. In the low-impact CBO and medium-impact Meer & West employment scenarios, raising the New York’s minimum wage to $12 per hour would, on net, increase total wage earnings among low-wage workers. In the CBO model, a $12 minimum wage would, on net, raise low-wage worker total wage earnings by $3.8 billion or 0.7 percent. 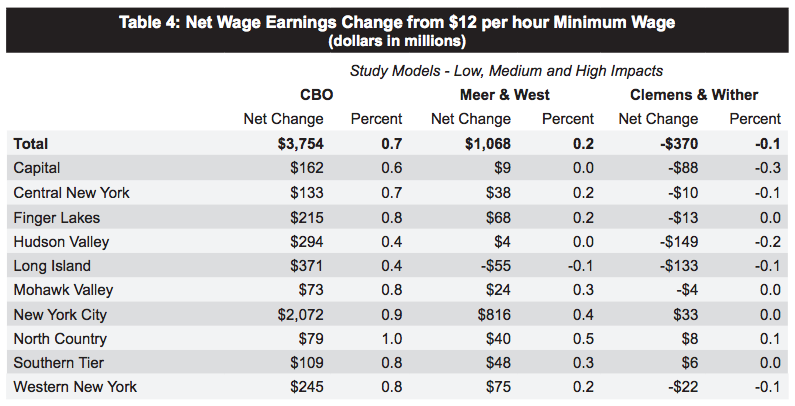 In the Meer & West model, it would raise low-wage worker total wage earnings by $1.1 billion or 0.2 percent. However, in the high-impact Clemens & Wither employment model, the earnings lost stemming from the reduction in jobs actually outweighs earnings gained among those who remained employed. In particular, low-wage worker total wage earnings would, on net, decline by $370.2 million or 0.1 percent. In this case, the regions with the most low-wage workers could potentially see the largest total wage earnings gains. 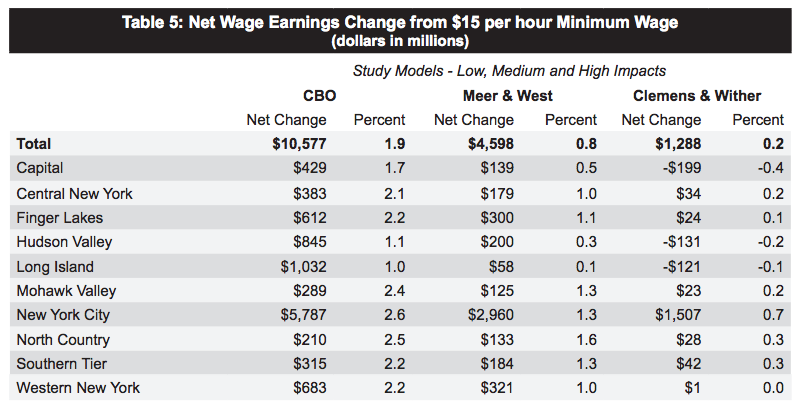 In the Meer & West scenario, for instance, net total wage earnings would rise by 0.5 percent in the North Country and decline 0.1 percent on Long Island. Table 5 illustrates how raising the New York minimum wage to $15 per hour would affect total wage earnings for low-wage workers. In total, we estimate that raising New York’s minimum wage to $15 per hour would, on net, increase total wage earnings for low-wage workers by between $1.3 billion and $10.6 billion. The net total wage earnings gains in the $15 minimum wage scenario would be much larger than in the $12 minimum wage scenario because the $15 minimum wage would both impact more workers and raise their average wages by a larger margin. In the medium-impact Meer & West employment scenario, total wage earnings would, on net, rise by $4.6 billion. The CBO model again results in the largest net total wage earnings gain ($10.6 billion) because it projects the fewest job losses. In this case the Clemens & Wither model projects the smallest net total wage earnings gain ($1.3 billion) because it projects the most job losses. Once again, the regions with the most low-wage workers tend to have the largest total wage earnings gains. In the medium-impact Meer & West employment scenario, total wage earnings in the high-wage Long Island region would, on net, only increase by 0.1 percent. But in the low-wage North Country region, total wage earnings would, on net, increase by 1.6 percent. It is important to understand that very little wage earnings gained from raising the minimum wage actually benefits workers who live in households below the poverty line. Due to poverty data limitations, we are unable to estimate what portion of the projected total wage earnings gained in New York from each minimum wage hike would go to workers in poverty. In our previous, nationally focused report, however, we found that under the Meer & West model only 5.8 percent of net total wage earnings gained from raising the federal minimum wage to $12 per hour would actually go to workers in poverty. Applying this estimate to New York would mean that only $61.9 million of the $1.1 billion net total wage earnings gained would go to workers in poverty. Likewise, we found that only 6.7 percent of the increase in net total wage earnings from a $15 per hour federal minimum wage would benefit workers in poverty. In New York, that means that of the $4.6 billion gained from a $15 minimum wage, only $308.0 million would benefit workers who are in poverty. It should also be noted that these projections of employment impacts and net changes in total wage earnings do not take into account the economic impact of any price increases resulting from higher minimum wages. There is a substantial body of research concluding that raising the minimum wage would also raise prices, and that the higher prices would disproportionately burden low-income households and families. MaCurdy (2014) analyzed how the 90 cent federal minimum wage increase from $4.25 in 1996 to $5.15 in 1997 impacted prices. The restaurant industry, which has the highest concentration of low-wage workers, increased average prices by 1.85 percent. Families spent $136 (in 2010 dollars) more per year on average due to this modest minimum wage hike. Moreover, the price increases facing families in extreme poverty imposed a slightly larger percentage increase in their annual expenditures than it did for families who were not in poverty. In particular, the minimum wage hike increased annual expenditures for families with incomes less than half the poverty threshold by 0.63 percent. For families with incomes more than three times the poverty threshold, it increased their expenditures by 0.56 percent. A $12 and $15 per hour minimum wage in New York may indeed increase total wage earnings after accounting for job losses. But, only a very small portion of the total wage earnings gained from the policy would actually benefit those it intends to help: households in poverty. Meanwhile, evidence suggests it would disproportionately burden those in poverty with higher prices. Across the nation, lawmakers continue to debate the merits of raising the minimum wage to $12 per hour and to $15 per hour. In this paper, we estimate the employment and wage earnings effects of raising the state minimum wage in New York to $12 and to $15 per hour. We find that any potential benefits from raising the minimum wage would be greatly offset by the negative labor market consequences of the policy. In particular, the wage earnings gains from raising the minimum wage would come at a significant cost to the large number of workers who would become jobless. In effect, raising the minimum wage transfers wage earnings from the low-wage workers who are unfortunate enough to become jobless to the low-wage workers who remain employed. 1. 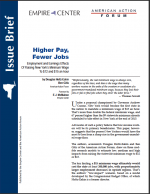 Congressional Budget Office, “The Effects of a Minimum-Wage Increase on Employment and Family Income,” February 2014,https://www.cbo.gov/publication/44995. 2. Jonathan Meer and Jeremy West, “Effects of the Minimum Wage on Employment Dynamics,” August 2015, http://econweb.tamu.edu/jmeer/Meer_West_MinimumWage_JHR-final.pdf. 3. Jeffrey Clemens and Michael Wither, “The Minimum Wage and the Great Recession: Evidence of Effects on the Employment and Income Trajectories of Low-Skilled Workers,” National Bureau of Economic Research, December 2014, http://www.nber.org/papers/w20724. 4. Douglas Holtz-Eakin & Ben Gitis, “Counterproductive: The Employment and Income Effects of Raising America’s Minimum Wage to $12 and to $15 per Hour,” American Action Forum & the Manhattan Institute, July 2015, http://americanactionforum.org/research/counterproductive-the-employment-and-income-effects-of-raising-americas-min . 5. Ben Gitis, “The Steep Cost of a $10 Minimum Wage,” American Action Forum, October 2013, http://americanactionforum.org/research/the-steep-cost-of-a-10-minimum-wage. 6. The 1.7 million jobs figure is based on authors’ analysis of Clemens & Wither (2014) estimates. 7. Clemens & Wither (2014) accounted for the effects of the recession by using state, time, and individual effects and controlling for the Federal Housing Finance Agency (FHFA) House Price Index. For more information on their methodology, see http://www.nber.org/papers/w20724 . 8. New York’s current statewide minimum wage is $8.75 per hour. Under current law, however, the minimum wage is scheduled to increase to $9 per hour at the end of 2015. Therefore, to analyze the impact of raising the minimum wage relative to current law, we estimate the employment and income effects of increasing it from $9 to $12 and $15 per hour. 9. Employment Projections, Labor Statistics, New York State Department of Labor, https://labor.ny.gov/stats/lsproj.shtm . 10. Quarterly Census of Employment and Wages, Labor Statistics, New York State Department of Labor, https://labor.ny.gov/stats/lsqcew.shtm . 11. We thank Bob Scardamalia of RLS Demographics, Inc. for performing this portion of the analysis for us. 12. As in our previous paper, we follow CBO methodology and assume baseline wages increase 2.9 percent each year to project future wage levels. In addition, the latest regional ACS data are from 2013, which is before New York’s current state minimum wage law was enacted. As a result, even after assuming wages grow 2.9 percent each year, some workers still end up earning below the current law $9 per hour minimum wage in 2018 and 2021. We address this issue by assuming any workers projected to earn below $9 per hour by 2018 and 2021 will earn between $9 and $12 or $15 per hour. 13. Regional estimates in Tables 1 through 5 may not add to state totals due to rounding. 18. Again, we thank Bob Scardamalia of RLS Demographics, Inc. for performing this portion of the analysis for us. A $15 an hour statewide minimum wage could cost New York at least 200,000 jobs. Proposed $15 minimum wage, supposed to help working poor, would actually hurt them by reducing job opportunities. A $15 minimum wage would leave hundreds of thousands earning the true minimum: zero.